Some have a gift for great food. Others would love to get one from you. 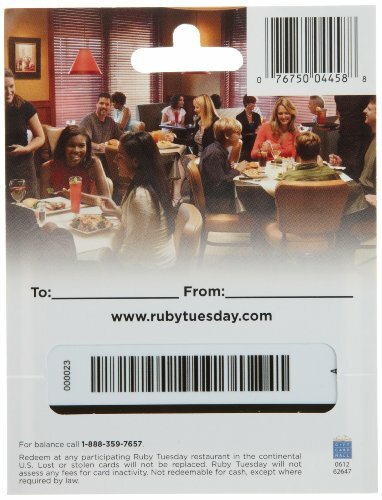 So purchase a Ruby Tuesday gift card and reward your friends and family with fresh, delicious Ruby Tuesday selections. From our Fresh Garden Bar to Americas best burger, from affordable lunch combos to signature entrees, the Ruby Tuesday menu is full of variety and value. They’ll smile when they get it. They’ll smile even more when they use it. Give that special someone the gift of Simple Fresh American Dining. 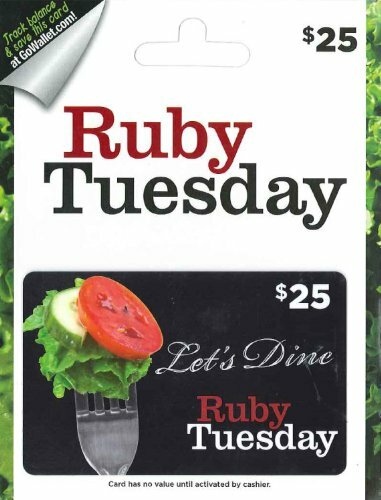 Ruby Tuesday is driven by uncompromising freshness and quality, gracious hospitality and a growing list of restaurants destined to be the envy of the casual dining business. Amazon.com Gift Cards cannot be used as a method of payment for this item.